Which social media sites are the right fit for your business? n just the past decade, social media sites have gone from an optional pastime to a necessity not only for private users but also for businesses and brands alike. Today, it is hard to think of a business – big or small – that isn’t present on at least a couple of different social media sites. According to the research conducted by Global Web Index in 2016, 94% of online adults have an account on at least one social media site. There are many reasons why we turn to social media these days. Via various social media sites we seek information about products and services we are interested in, we stay informed about the world news and we keep in touch with friends and family. In the mentioned report, the Global Web Index discloses that 4 out of 10 social media users follow their favorite brands on social media, and more than 1 in 3 internet users say they go to social networks when looking for more information about a brand or product. It makes sense, then, for any business to be present on social media sites not only to market their products but to provide desired information about their products and services, to provide customer support, to keep an eye on their rivals and to engage with the fans – all in equal measure. Not all social media sites are created equal, though, and what might be working for Nike and Starbucks might not work for you and your company. In this article, we will discuss social media networks and provide you with the information you will need in order to make a vital business decision; Which social media sites to focus on for your business. First of all, let’s talk about the large pink elephant in the room. It’s true. If you are a B2B company, social media won’t be as clean-cut and easy as it can be for B2C companies. However, this definitely does not mean B2B companies should avoid social media, or that they can afford to neglect their social media profiles. It only means that, if you are a company with a B2B business model, you will be focusing on different social media networks and will try to work different social media strategies in order to reach your goals. The biggest social media platform any B2B company should focus on is, of course, LinkedIn. LinkedIn is responsible for 80% of B2B social media leads, while Facebook, Google+, Twitter and Pinterest all together amount to 19,67%. Does this mean you should focus only on LinkedIn as the one and only social media platform for your B2B company? Absolutely not. While you should definitely put the most effort and time into being active on the platform which generates you the largest amount of leads, there are a couple of reasons why being active on other social media networks is also very important. Other social media networks B2B companies should focus on are Twitter, Quora, and Facebook. Once you get a handle on those networks, feel free to experiment with other social media. While some might not turn out to be the right fit for your business, others can – albeit after a bit of testing and digging around – surprise you and turn out to be your personal gold mine for lead generation. Not much is set in stone when it comes to social media, and while a strategy might work for one niche it could be a complete waste of time for another. 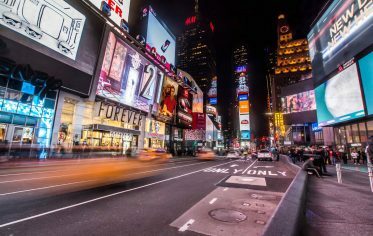 Even companies in the same niche will often have different results, depending on their location, their social media strategies and efforts, and even their brand voice. Above all else, always remember social media isn’t a tool you should use to sell your products. Instead, use it as it is meant to be used – as a relationship building tool. On social media, B2C companies enjoy the privilege of being able to get more creative with their social media efforts, but this also means they have a lot more vetting to do before they can reach their targeted audiences. Whether you are running social media for a B2B or a B2C company, these are the three big questions you have to ask yourself. Finding correct answers to these questions will help you decide which social media networks are the right fit for you and your business. 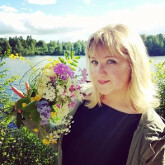 What does my target audience want to see on social media? You already know the answer to the first question, of course. Answering the other two will take some sleuth-work and creativity, so let’s get to it! Is your target audience predominantly male or female? According to numerous studies done on the subject, men and women tend to prefer different social media networks. This makes sense, as our interests usually differ, too. Women are drawn to social media sites which serve visual content and help them connect with friends and family. They spend most of their time on Facebook, Pinterest, Instagram and Tumblr, while men prefer to spend their time on social media discussing news and ideas and will, therefore, choose to spend their time on social media sites like Reddit, Digg, Twitter, and various online forums. 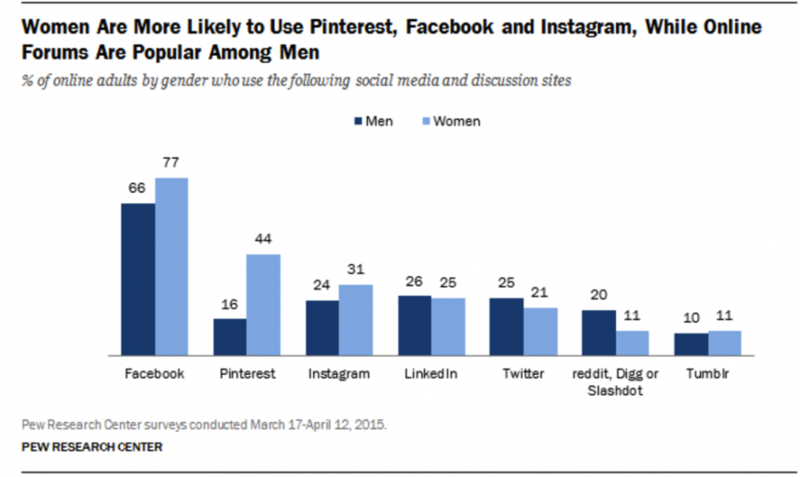 Pew Research Center survey conducted in 2015 shows the percentage of men and women on different social media sites. Interesting to point out is that men and women are equally active on LinkedIn. If your target audience is predominantly male, it makes sense to focus on creating content and providing value on websites such as Reddit, Twitter and Quora, while if you are aiming to reach the female audience your investments should go toward creating content and serving ads on websites such as Facebook, Pinterest, and Instagram. You likely know the age groups your products and services are aimed toward, as well. Teenagers and young adults are most active on messaging services such as Snapchat, Kik, Wechat and Facebook Messenger. They are also very active on Instagram, YouTube and Tumblr. If your target demographic is between the ages of 25 and 34, you will want to focus your efforts on Instagram, Pinterest, Tumblr, YouTube, Google+ and Facebook, respectively. Adults between the ages of 35 and 44 are most active on Facebook and Facebook Messenger, Twitter, Google+ and LinkedIn, but also like to use Pinterest and YouTube. Not a lot changes in our next age group. 45 to 54-year-olds Seem to enjoy Facebook, LinkedIn, Twitter, Pinterest, and YouTube just as much, and the oldest demographic represented in the chart by Global Web Index, 55 to 64 years of age, is predominantly using Facebook, LinkedIn, Google+, YouTube, Pinterest and Twitter as well. 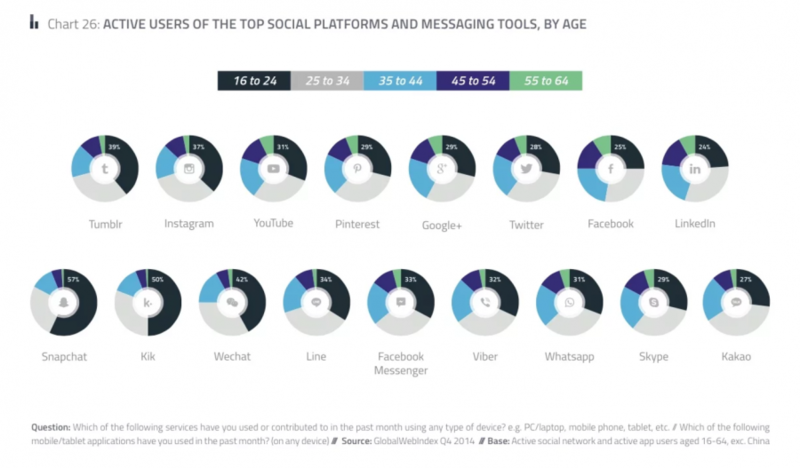 Global Web Index research from 2014 pictures active users of the top social media platforms and messaging tools, by age. Now that you know where your target audiences are, it’s time to move on to the next big question. You’ve figured out which social media sites your target audiences are active on. It’s time to start giving your followers what they want. People join and use social media sites for different reasons. Even smaller groups of people that fit into the same gender and age group will have different habits and preferences of what they like to see on social media and so finding out exactly what type of content your followers prefer to see from you will take some testing and tinkering. And then? Even more testing and more tinkering, until you’ve got your social sharing down to a science. Even then; as your following grows you will need to go back and iterate. To figure out what type of content your social media followers prefer to see you will need to try a couple of different things and gauge their reactions – or rather, engagement. Let’s say you are a B2C company, selling a certain product. It can be anything. It can be makeup or vegan cookies. Your target audience is likely women, aged 20 to 40. Which social media networks have the highest amount of female users in the specified age group? By now, you can probably say off the top of your head that those networks are Facebook, Instagram, and Pinterest. We already know women prefer visual content to written content. You can now go ahead and take high-quality photos of your product to share on your social media sites and see how they do. Was the engagement rather high? Great! Tomorrow, you will want to try and share a different type of content. Perhaps you can write an article? Or film a video tutorial on how to recreate a certain look, or bake delicious vegan cookies at home! Which type of content performed the best? The photo? The article? Maybe the video? Finding out which type of content your audience prefers doesn’t happen overnight and it takes a lot of tinkering, some creative thinking and a bit of patience. Don’t get discouraged if a type of content you were certain would be a hit doesn’t exactly resonate with your audience – that is fine. There are no bad ideas when it comes to these things. You will learn something out of every chance you take. Remember step one and two? Not all social media sites are a good fit for all businesses. This is where some strategical thinking and some trial and error come into play. If you are running social media for a B2B company, or your B2C company simply isn’t selling anything photogenic, think of the value you can provide to your social media followers that go beyond images. You are a professional at what you do and you surely have the knowledge you can share with others. Prove yourself a leader in your industry by writing educational articles and share them with your audiences on your blog or by answering questions on Reddit and Quora. Link your writing to your Twitter and post your articles on LinkedIn. No matter which niche you operate in – you have knowledge that other people are after. Provide value to your social media followers and you will slowly but surely establish yourself as a thought leader and an influencer. Today, it only makes sense for a business to be present on social media. Which social media sites you will focus your efforts on depends on the type of business you are running, which social media sites your audience uses and what type of content you are able to provide to your followers. In this article, we’ve given you a general idea of which social media sites you should aim for, depending on the business you run and your target audience. We hope you found it useful! If you are struggling with creating content for your social media profiles, take a look at an article we wrote, “13 social media post ideas for your business”. We are sure it will inspire you to create amazing content for your social media pages! 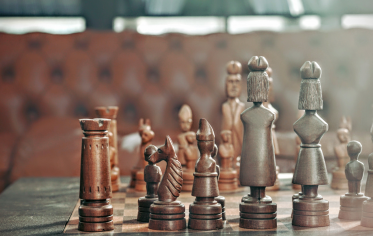 What’s the secret to a good social media strategy? Consistency! Some days, however, it’s hard to find a good topic to post about. Fear not! The Wallery team brings you 13 social media post ideas perfect for any brand or business. Go on, try them out! Whether you are tweeting for yourself or representing a business, a well thought-out Twitter strategy will help you connect with your followers on a more meaningful level, as well as strengthen your brand image. What exactly is user generated content (also known as UGC)? What makes it such a valuable thing and where can you find it? How can it help you build a stronger brand, as well as raise your sales? This article answers all of these questions, and more!